Lyle Browne has been personally invested in Susan G. Komen’s mission for many years. As a long-time Race participant, she’s supported the event in whatever city she happened to be living in at the time: Washington, DC, Austin and Indianapolis to name a few. After giving birth to twins and moving back to the Indianapolis area, a friend who volunteered for Komen said she would give Lyle a year to get settled and then she would get her involved. “She was true to her word and next thing I know I’m having a blast working with people I enjoy for a cause that is near and dear to my heart,” Lyle said. 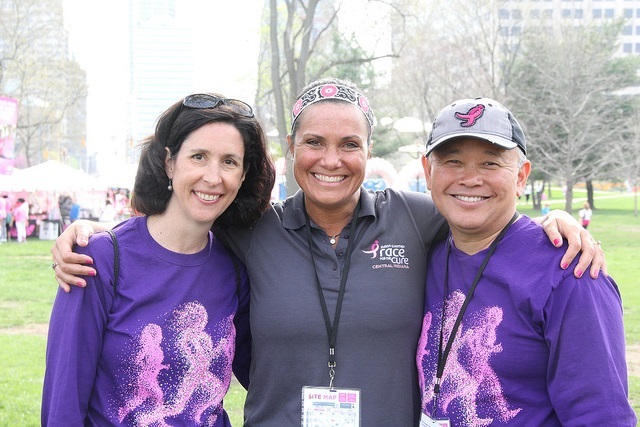 Since 2003, Lyle has been a member of various Komen Central Indiana committees, including serving as the treasurer for the Pink Tie Ball for two years, sitting on the Race Sponsorship Committee, serving as the Sponsorship Co-Chair and as the Sponsorship Chair from 2007-2009! That is just the beginning of Lyle’s involvement. Since 2010 she has served as the Co-Chair of the Race Day Logistics Committee. She served on the Board of Directors from 2010-2015, including two years as Board President. As an active member of the logistics team, Lyle isn’t afraid to get her hands dirty when it comes to helping with events. At the rainy 2017 Race for the Cure, which was cancelled due to severe weather, Lyle was hard at work helping to clean up the parl. At one point, we found her soaking wet, wiping down signage to make sure it wasn’t going to be ruined for years to come!